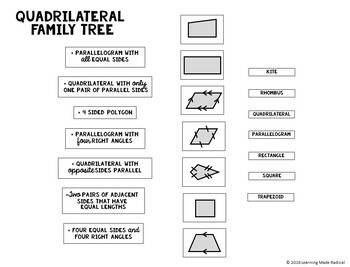 Looking for a resource to help your students understand how geometrical shapes are organized?! 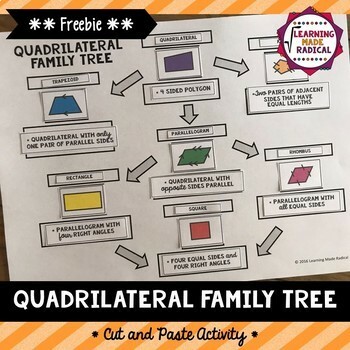 This is great activity that allows students to organize the name of the name if geometrical shape, geometrical shape and a small description of the geometrical shape into a flowchart. 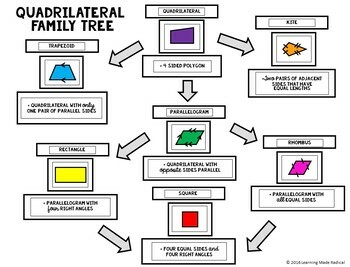 Start with the quadrilateral and organize it into trapezoid, kite and then parallelogram shapes - rectangle, rhombus and square. This version is NOT editable! It does come in a black/white version or a colored version as well. There are a few options that are included and you can decide which will be better to present to your students - a completed version or have students to complete the cut and paste activity. Looking for a great interactive notes activity? Looking for other area and 6th grade geometry activities? Check them out below! Want to get EVERYTHING listed above and SAVE some money?! Check out this fun filled BUNDLE!